On Saturday March 17 it was England [who we hadn't faced in a year] at Twickenham, with the whole country behind the team. On Saturday May 12 it was Racing Métro [who we hadn't faced in several years] at Bilbao, with all of Leinster and, well, let's just say a portion of the rest of the country behind the team. 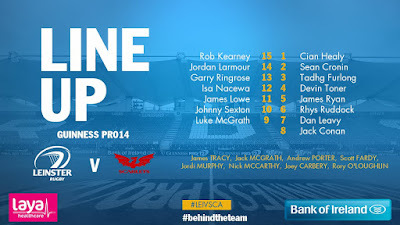 Now on Saturday May 26 it will be the Scarlets [who we played five minutes ago for the gagillionth time in 2018] and I can pretty much guarantee in the entire rugby universe outside of Leinster will be up for the Welsh region to retain their title [c'mon, we all know it's true, and I'm not saying that's a bad thing]. Whatever happens at the Aviva Stadium this weekend, it will have already been the best ever campaign since we started harpin' on Leinster & Ireland rugby. If you told me back in late August that we'd have 5 for 5 in the Six Nations and 9 for 9 in Europe I'd have been a very happy bunny indeed. I probably wouldn't have minded your telling me that in the Pro14 we'd lose at home to Treviso and get hockeyed in Galway by Connacht...I'd say that sacrificing the domestic competition wasn't a bad prioce to pay for the success elsewhere. But hang on...those defeats did happen yet here we are in yet another momentous history-defining contest. For the week ahead of the 'Grand Slam' I was determined not to use those words. For the week ahead of the 'Fourth Star' I did likewise for that phase or anything close to it. Now I have another two words to avoid...let's just say they'll sum up the 2017/18 campaign nicely should the result go the right way. On that note...can it? Have Leinster a chance? After a couple of close calls, can we get past what is bound to be a very determined and organised Scarlets outfit? The simple answer is, of course we can, but I'm not so sure if our defence and opposition errors will be enough to get us through this time. We'll need to be a lot closer to the Leinster we saw against Sarries and these very same Scarlets in the European knockout stages, hopefully the fact that it's at the same venue will help us do just that. Also we've a lineup much closer to our 'ideal' one...led of course by Johnny Sexton. As long as he's dictating what happens, we're always a step ahead. So what can stop him doing the dictating? That would be the forwards. I must admit I raised an eyebrow when I saw Scott Fardy on the bench once more and I'm wondering if this is some kind of specific plan to counter the Beirne Supremacy. Tadhg seems to have worn every number from 4 to 8 for the Scarlets this season yet his destructive influence on both breakdown and lineout has always been immense. How much havoc he is allowed to wreak could decide the day. That's not to say the champions don't have other ways to hurt us, like Shingler and Davies alongside Beirne in the back row, Williams and Parkes in the centre and I dare say Leigh Halfpenny is more than keen to have a good outing against us. But man for man across the fifteen we can at least match them, and if we play the way we have shown we can this season we have every chance. I have said this all season - our centre pairing needs to be solid, especially defensively. I thought we were in trouble when Isa went off at halftime against Munster but Rory O'Loughlin put in some fine bouts of jackling to prove me wrong. This will be another stern test for those channels and we'll need to be on our guard for the full eighty. On the subject of those missing out on the day, it's a tough call for Jamison Gibson-Park, particularly after he did so well the last time the Scarlets came to town, but Leinster's little three-into-two equation was always going to make for tough decisions. That's where it takes good management from the likes of Leo Cullen to make sure the players understand. As for referee Stuart Berry...my only quibble with his appointment is that we had him last week. It's bad enough that the Welsh press have the Aviva Stadium to moan about without us seeming to have the official as a slight advantage as well! But when it comes to his style...in general, both teams will just have to get used to it though I'm sure there will be a call or two we'll be debating afterwards same as any other match. The bookies have us winning by ten points. Anyone who has read these pages will know I tend to be more conservative in my predictions and this is no exception. If we do get a double digit margin I think we'll need a late score to do it but I actually think that for the third week in a row we'll only get there while being anxious up to the final whistle...I'm saying 4 to 6 points. Replacements; Ryan Elias, Wyn Jones, Werner Kruger, David Bulbring, Will Boyde, Jonathan Evans, Dan Jones, Tom Prydie.